Isreal Suarez Lugo, 35, was charged with two counts of intoxication assault for Sunday's crash. The crash occurred about 1:15 a.m. at the intersection of Harrisburg Boulevard and 75th Street in east Houston. Sean Teare, chief of the Harris County District Attorney's Office's Vehicular Crimes Division, said investigators believe Lugo, the driver of a red pickup truck, had been drinking at Time Out #1 sports bar and was headed to a relative's home when the crash happened. He said witnesses saw Lugo swerve around some vehicles before running the light and broadsiding the sedan that was carrying two children. "He couldn’t stay in a single lane. He passed a number of vehicles in a turn lane, ran red light and broadsided this Cadillac," Teare said. Officers said a woman passenger in the sedan, who was severely injured, was taken to a hospital. One of the children, a 5-year-old girl, was also taken to a hospital and is fighting for her life, Teare said. Jonmichael Ramirez, the fiance of the woman who was injured, identified her as Kimberly Saucedo. He said Saucedo broke her collarbone and six ribs. He said she is being treated in the intensive care unit at Ben Taub Hospital. At left, Kimberly Saucedo is seen in an undated family photo. At right, Saucedo is seen lying in her hospital bed in Houston on Jan. 21, 2019. Ramirez identified the injured girl as Saucedo's niece and said she is not doing well and is being treated a Texas Children's Hospital. 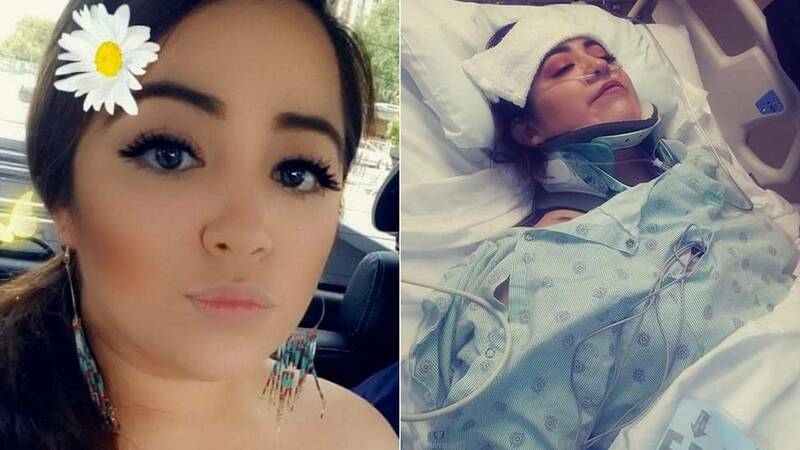 Ramirez said the woman who was driving the vehicle that was hit was Saucedo's sister, who is the mother of the critically injured girl and the 15-year-old boy who was also in the car. Both the mother and the teen were not seriously injured. 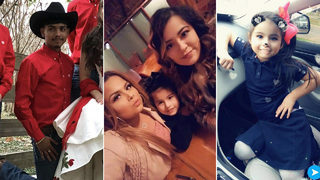 New images provided by the mother of 5-year-old, Giselle Luviano show family members involved in a crash that left Luviano and her aunt, Kimberly severely injured, Jan. 22, 2019. Giselle Luviano, 5, and her aunt, Kimberly were severely injured in a crash, Jan. 20, 2019. New image provided by the mother of 5-year-old, Giselle Luviano shows her aunt Kimberly, Luviano and her mother. Luviano and her aunt were severely injured in a crash, Jan. 20, 2019. New image provided by the mother of 5-year-old, Giselle Luviano shows Luviano's brother, Joel, who was in the car when they were involved in an accident that left Luviano and her aunt, Kimberly severely injured, Jan. 22, 2019. At left, the scene of a serious crash is seen Jan. 20, 2019, in east Houston. At right, Kimberly Saucedo is seen lying in her hospital bed in Houston on Jan. 21, 2019. Lugo was not injured. He was arrested and booked into Harris County Jail. If convicted, he faces up to 10 years in prison. "It's unacceptable we get calls about this every single night. We're on these scenes every single night," Teare said. "It's a tragic occurrence that we have to be out here every night." Teare said this crash was one of a series of crashes over the weekend that included serious injuries or fatalities. In one of the crashes, a man stopped his car in traffic in the 1000 block of the West Loop, police said. He was hit by another driver and killed. On the north side, in the 9300 block of Tidwell, police said a pedestrian was struck by a car that jumped the curb, killed him and kept going. There were no witnesses. In the 8500 block of the West Loop at Bissonet, two people were killed after after an alleged drunk driver struck their car, according to police. Editor's note: The district attorney's office had sent out an email to KPRC2 saying the woman had died but later said she was still alive.